This morning, I invite you to visualize peace. What would peace look like for you, and how would you describe that? I’m going to invite you to close your eyes, and in your mind, visualize a picture of what you think of when you think of peace. So, breathe deeply…let it our slowly…please close your eyes…and begin. Ok, so if you are willing, please share with the person to your right or to your left, behind you or in front of you, your picture of peace. Go ahead and do that now. Thank you! Thank you for participating in that little exercise. The images I come up with may be something like yours. When I picture peace, the first sets of images have to do with nature. I picture quiet scenes, far from the crowd, a quiet lake, a sandy beach, a blue sky, with perhaps a few clouds slowly drifting by. Another set of images then comes to mind: people together, smiling, getting along, and quietly enjoying one another. My images of peace have people at leisure activities, never at work. I find that interesting. I see myself in a hammock, sipping some cold beverage and no mosquitoes – Maybe a jazz quartet serenading me. That’s how I picture peace. Peace has two parts as I see it. There is the peace in my circumstances. Let’s call that external peace. And there is the peace in my heart and mind. Let’s call that internal peace. And the way I ordinarily connect the two is like this: When I have peace in all my external circumstances, then I have peace in my heart and mind. When I do not have peace in my heart or mind, I blame it on my circumstances – you know, something happened at work, or someone said something that upset me, a health issue, or whatever it is, and right now, because of that, I’m not feeling any peace. That’s how I usually think about getting peace – By producing external conditions I like, so I feel peaceful inside. Maybe it’s similar for you. The world teaches us that peace comes as a result of favorable circumstances in our lives. But Jesus offers a peace that we can have, even though our circumstances are difficult or challenging. If I’m going to find peace, I would expect to find it in the way the world gives peace—by making everything, and everyone around me to be nice and calm, so I have no worries, no troubles, and no hassles. Then I will have peace. But that’s not how Jesus gives peace. He turns it around. He gives us peace in advance of the improvement of our circumstances. He embeds peace in the gifts of faith and hope and love, so that we can work in the midst of a suffering world, as people who also suffer, yet know peace already, before it has been fully delivered. Jesus turned things around when he said, instead of doing to others as they have done to us, we should do to others as we would have them do to us. Jesus turned things around by making us ambassadors of his grace and mercy and love to a broken, and sometimes hostile world. So, how does Jesus give that kind of peace? In our gospel reading, Jesus tells us that the Holy Spirit will teach us everything and remind us of all that Jesus has said to us. The ministry of the Holy Spirit will help us to remember who we are, ‘whose’ we are, and why we are here. And in that, we will find peace. • First, He knew to whom he belonged. He had come from God; God was the source of his life. • And then, second, Jesus knew where he was going. He was going to God. Because he belonged to God, he knew that death could not separate him from God. • And third, Jesus knew what he was on earth to do – he had come to serve others. If we know those three things, we can receive the peace that Jesus gives. First, through baptism, remember that God has claimed you as his very own. We belong to God. The Holy Spirit reminds us: we are children of God. Second, because of what Jesus has accomplished in his death on the cross and in his resurrection, we know where we are going – nothing in life or death can separate us from the love of God in Christ Jesus our Lord. We belong to God now, and for all eternity. When the struggles of life come, the Holy Spirit reminds us that we are not alone in our struggles; we can ask God for strength; our troubles will not last forever, and a glorious future awaits. And third, we know what we are in this world to do. The Holy Spirit reminds us that we are here to serve others. Our Bible readings today tell us, that to live with those truths, strong in our hearts and minds, is to know God and to be at peace. 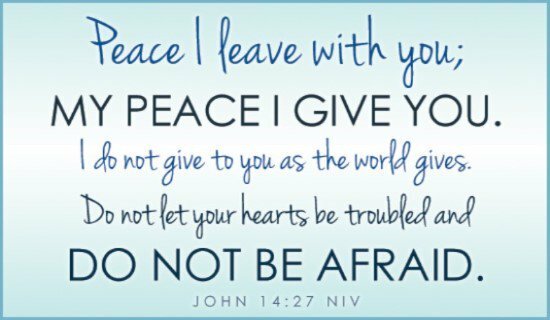 The Apostle Paul, in our reading from Philippians chapter 4, calls it “the peace of God that surpasses all understanding. It is a peace that keeps us from being overwhelmed by worry and consumed by despair. Our circumstances may change. Troubles may come. But we know to whom we belong, and we know we’ve been claimed for all eternity. And we know why we’re here. God is near to us and God is with us. We need not be “swallowed up” by our troubles. Jesus promises us a peace that does not depend on our external circumstances. Jesus knew that peace. The writer of Psalm 46 knew that peace. The Apostle Paul, writing from prison in his letter called Philippians, knew that peace. And now, Jesus says, that he will give it to us. THank you for another good sermon and I totally agree with your description of external peace but you need trees all around and only birds singing. AS to internal peace, for me that is hard to achieve.